This charming bouquet gives a contemporary twist to a traditional image. With our easy-to-follow instructions you'll be surprised at how fast you finish. Kit also includes printed fabric and cotton thread. Finished Size: 8" x 10"
Plump and proud, the black hen rules the roost. 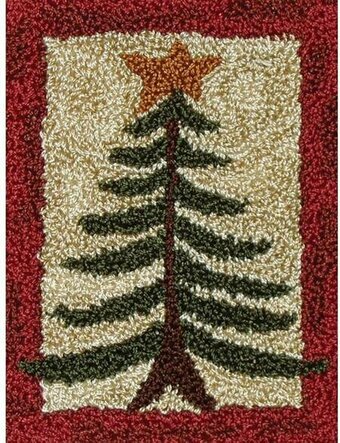 Punchneedle embroidery on khaki colored cloth creates a warm, homespun feeling. Finished size is 3 3/8" x 3 3/8". 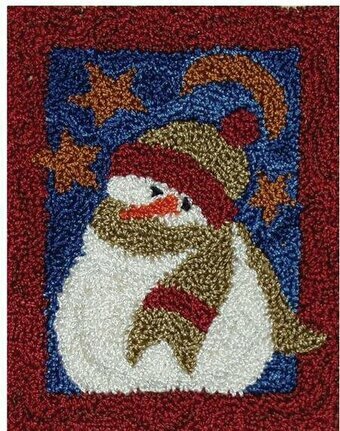 This punchneedle kit includes foundation fabric, iron-on transfer pattern, ALL floss to complete the project (DMC cottons), and illustrated instructions. DMC colors are blended in the stitching to create a mottled, hand-dyed look. Colors are black, red, straw, and dark olive. Sleek blackbirds with red heart wings share a stalk of plump berries. 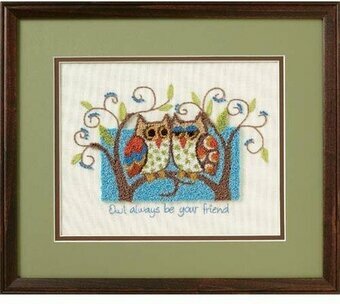 Punchneedle embroidery on khaki colored cloth creates a warm, homespun feel. Finished size is 2 1/2" x 4 1/2". This punchneedle kit includes foundation fabric, iron-on transfer pattern, ALL floss to complete the project (DMC cottons), and illustrated instructions. DMC colors are blended in the stitching to create a mottled, hand-dyed look. Colors are red, black, green gold, and off-white. Wrapped snuggly in his scarf and hat, this little snowman revels in the wonder of the winter sky. 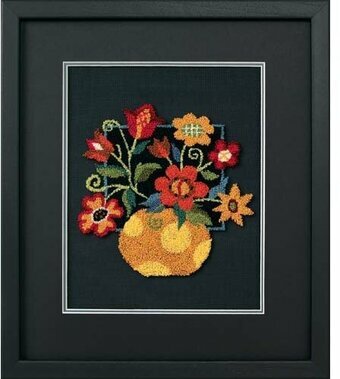 Punchneedle embroidery on khaki colored cloth creates a warm, homespun feeling. Finished is is 3" x 4". This punchneedle kit includes foundation fabric, iron-on transfer pattern, ALL floss to complete the project (DMC cottons), and illustrated instructions. DMC colors are blended in the stitching to create a mottled, hand-dyed look. Colors are midnight blue, red, gold, paper bag, and white. With its humorous saying and retro feel, this design is a charmer. Kit includes printed fabric, cotton thread, carbon paper for adding the verse, embroidery needle, and instructions. Finished Size: 10" x 8"
Tall and stately, this pine tree reaches for the stars. 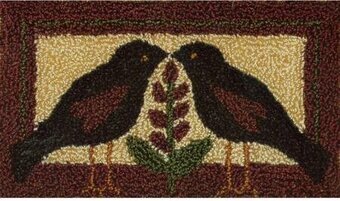 Punchneedle embroidery on khaki colored cloth creates a warm, homespun feeling. Finished size is 2 7/8" x 4". This punchneedle kit includes foundation fabric, iron-on transfer pattern, ALL floss to complete the project (DMC cottons), and illustrated instructions. DMC colors are blended in the stitching to create a mottled, hand-dyed look. Colors are red, gold, oatmeal, dark olive, and brown. Pompous and colorful, the rooster stands tall. Punchneedle embroidery on khaki colored cloth creates a warm, homespun feeling. Finished size is 3 3/8" x 3 3/8". 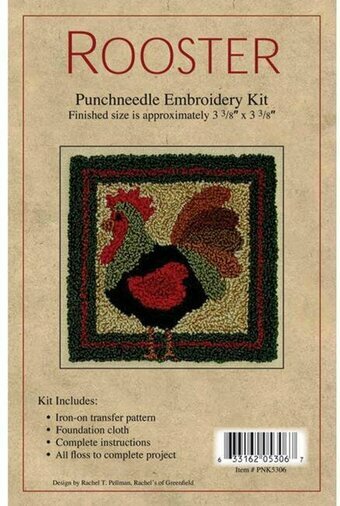 This punchneedle kit includes foundation fabric, iron-on transfer pattern, ALL floss to complete the project (DMC cottons), and illustrated instructions. DMC colors are blended in the stitching to create a mottled, hand-dyed look. Colors are black, red, straw, dark olive, gold, copper, brown, burgandy, olive.